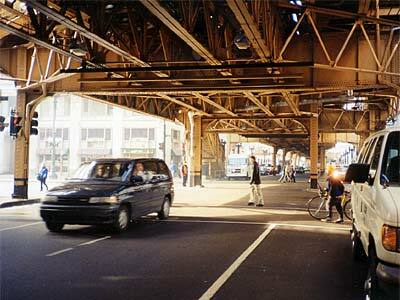 Street scene taken under 'The L' (Chicago's elevated rail transportation network). Built in the 1880s by four separate companies, Chicago's elevated train system was consolidated in 1924 as the Chicago Rapid Transit Company. In 1947, the transit system went public to become the Chicago Transit Authority.